I think this is because of a change in the Sheets API that it doesn't report the active spreadsheet anymore from a standalone script. Just delete the setUp function, and replace ScriptProperties.getProperty('active') in line 27 by the id of your spreadsheet and it should work fine. The links to the docs have changed: http://www.google.com/support/forum/p/apps-script/thread?tid=04d9d3d4922b8bfb&hl=en is a 404 now. Great little script - got it working too. Re the Cannot read property "parameter" from undefined. (line 37) error - this only seems to happen when running the app in the script console. Try creating a HTML form and posting the data from the form. Adding the inline params into the URL doesn't seem to work - assuming it's rewritten/redirected. happy to share my code if it would be of use to anyone. It seems to be common to run into a "Authorisation" errors too - if you encounter this, republish your web app and bump the version. just for my own knowledge, on line 62, if I use a value other than "Timestamp" it doesn't work. For example, if I create a header named "Date" and substitute "Date" with "Timestamp" on line 62. It does not work anymore. Why is this? When I attempt to use the form on a PHP page, using the Ajax connection, I'm getting an console error reading "No 'Access-Control-Allow-Origin' header is present on the requested resource." Do I need to set up Google API on my web page first? Im a novice. Heres what I want to do. I have a contact form on my website and a google sheet I use. How can I have users inserted into the google sheet using the contact form? Any help would be appreciated. Thanks! Thanks for this bit of code, really helped me out. I needed to make a revision to get it working (you can see that here if you want to make an update: https://gist.github.com/coreyphillips/f27025c86b838cc5372c/revisions), but works like a charm otherwise. Hi. I placed my form in Bootstrap modal, and Submit button just reload my page without sending data. But when form is placed directly to page - it works fine. Any thoughts on how to dynamically add a new column in the destination sheet if one of the web form parameters sent to the sheet does not already exist as a column name? Hi All, This has worked great for me in adding new records, but can someone point me in the right direction on how to update an existing row based on a unique field or column entry? While using this script, everything works fine(No error and logs) but the email field in the spreadsheet is not getting rightly filled and comes undefined. I am not able to solve the error. PFA the image. Its the exact same script. I see that your code only works with spreadsheet with one sheet, is there any way to work with spreadsheet has many sheets? When you say in line 4 under usage- "post this in your form/script action"
Do we need to create a new form from the spreadsheet and alter the url? Please clarify- thanks for the code. i just want to check post request, as per the request i want to save my datas in sheet1 or sheet2 how to alter the sheet names from above script..
@dassram17 i have not tried your requirement. but you can try to send the sheetname as a parameter of your form. just write the form tag in your own html. action is your webapp url. Thank you for the amazing script. Did not work out of the box, but worked with some minor tweaks. I get error "Failed to load https://script.google.com/macros/s/.../exec: Response to preflight request doesn't pass access control check: No 'Access-Control-Allow-Origin' header is present on the requested resource. Origin 'https://bar.com' is therefore not allowed access. The response had HTTP status code 405." @aravindk1992, would you mind giving an example of how to define to what spreadsheet your code writes? Has anyone been able to modify this code to update a specific row on a spreadsheet? 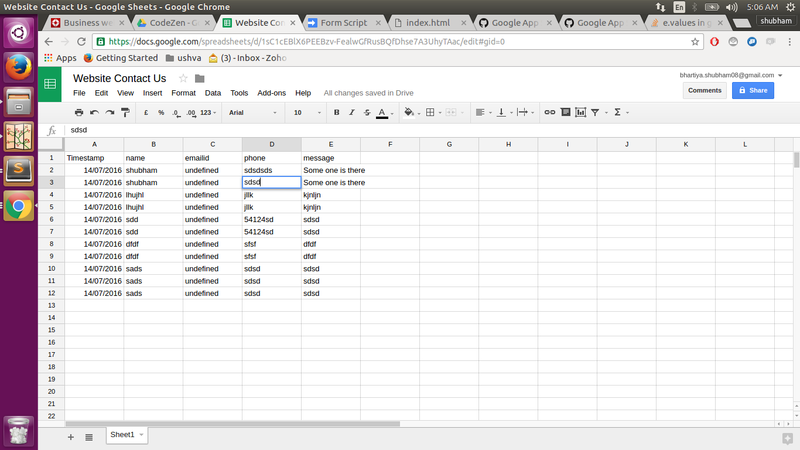 @followgeo The intent of this Gist is to add successive data to a sheet, as from an input form. The full Google Sheets API](https://developers.google.com/sheets/api/guides/values) is a good tool to use for updating a specific row. I've made this change in my fork of your Gist. Is there a way to fix the CORS error when doing a POST request? how does this code work it does not even have the url for the spreadsheet to write to? How do you have someone that does not have a gmail account insert a record into the sheet when they complete form? how to send data to the getRange spreadsheet ('C2'), in google script? how to send data to the Range spreadsheet in ('C2'), in google script?